You’ve heard the old adage: pick two. In this situation, it’s often true. If you want something high quality and fast, it’s going to cost money. If you want something that’s high quality and affordable, it’s going to take a long time. And if you want something that’s fast and cheap, it’s probably not going to be very good. Pros: You have complete control, can produce videos relatively cheaply, and can take your time on the production. You can pull your labor from those within your company, therefore saving money and utilizing “down time” in your business. Cons: It’s not likely that you’ll be able to produce a very high quality video. If you try your best to produce a high quality video, you’re going to be spending a lot of time and potentially a lot of money. Many companies seek to produce their videos internally because they assume it will cost less — and it can. If your company is dedicated to producing its own videos and is going to be producing small, easy to produce videos on a regular basis, then investing in mid-range equipment and developing the necessary skills may actually be a viable strategy. However, most businesses are never going to be able to afford the time, equipment, or talent that it’s going to take to produce lengthy, professional videos. The best videos to produce internally are live stream videos and internal, corporate messaging. Videos such as commercials or other marketing messaging usually shouldn’t be produced internally. Internal production can actually end up being more expensive for a company because most companies do not have the equipment or the resources to complete a production. Simply renting lights, cameras, and sound equipment can end up being more costly than hiring a professional, simply because there isn’t the volume there — buying equipment is far more affordable, but only if the company is going to be producing videos for a long time to come. This also introduces another element for the business to worry about, as they must maintain and upgrade their equipment, find professionals who understand the software, and teach their employees the basics of video production. Here is an example of a video shot by a non-professional. It gives you the intended info but is fairly rudimentary. It accomplishes its goal but is not broadcast quality by any means. Pros: Much faster for smaller projects and usually fairly fast. A single professional — if they have all the equipment — can still produce polished, high quality video, and can often work faster than an organization who isn’t experienced in the work. Cons: A single professional isn’t going to be able to create large projects without help and they aren’t going to be able to scale up their services without scaling up their costs. For larger projects, this simply may not be feasible. Sometimes working with a single professional can be appealing for a business. Consider a business that wants to do internal company memos in video every month. Though they could shoot internally, that would require that the company purchase or rent equipment and learn how to do so. Hiring a solo professional means that they can have someone come in, help with the shot, edit the shot, and then produce it in a relatively fast amount of time. This is far preferable to having to complete the video internally or having to hire a full production studio. At the same time, this is a relatively niche option because it’s really only for small and routine projects. A single professional isn’t going to be able to do something as extensive as a full commercial because they usually don’t have the resources — and to acquire the resources may be more expensive than working with a studio to begin with. Additionally, relying upon a single professional can be risky, as if they are unavailable the company will be without video production. In this example, the first thing you’ll notice is the animated open. This automatically tells the viewer this was done professionally. The videographer used a tripod and the lighting is okay. The on-camera talent may or may not be professionals but appears comfortable on camera. There are cut-away shots to show the action. Lastly, there is music in the background. All in all, this is a successful video in that it gets the point across of promoting their clothing. Pros: You can integrate your video better with your ad campaign, your ad company will be able to outsource video production to the best company (or to complete it internally), and you’ll be able to create a lasting relationship with them. Cons: They may not have direct expertise in the area of video, and consequently your video may not be as professional or cost-effective as it should be. Many advertising agencies now offer video production as one of their main draws. Many of these videos are things like product videos, landing page videos, and explainer videos, and they are a solid choice for videos that are well-integrated into an advertising campaign. Ad agencies are going to be able to create advertisements first and foremost, so they are extremely valuable within that aspect. They can usually create affordable videos and fast videos, though their videos may not be of the highest quality. Some advertising agencies conduct this internally but others actually outsource to professional video companies. However, depending on the advertising agency this can have different types of downsides. If the ad agency tries to complete things internally, they may not have the skills, experience, or equipment to create well shot, long format, or professional videos. Instead, they may be primarily concentrating on advertisements and more aggressive forms of advertising. If the ad agency is outsourcing to a professional video production company, you may ultimately end up spending more money because the cost of the video will be marked up. You will not only be paying for the professional company but also for the interactions between the two companies. Using an ad agency is usually the best idea for companies that are working with video that engages directly with their marketing campaigns, such as landing pages that are going to be on their website. An ad agency may also want to directly work with a company’s video production company to ensure that brand and voice are consistent. Here is a television commercial from Victoria Secret for their holiday promotions. The first thing you notice is this is a highly stylized video. They hired professional actors, and not just any actors; Victoria Secret models! The sound is just as important as the visuals. It’s a really cool concept. Pros: You generally have better control over your project than with an ad agency and a video production company usually lowers costs substantially by already having a lot of the overhead taken care of. Cons: For smaller projects, a video production company can sometimes be overkill. All around, a video production company is usually the best option for a moderate to complicated video. Video production companies already have all the equipment, skills, and talent necessary in order to complete a production, and they are extremely skilled at ensuring that the production meets deadlines and is up to professional grade. Video production companies are able to develop the best projects the fastest, and they have usually already done the work that is necessary to reduce their overhead and reduce their prices. Just as importantly, a video production company is usually fairly versatile and can create any type of video. 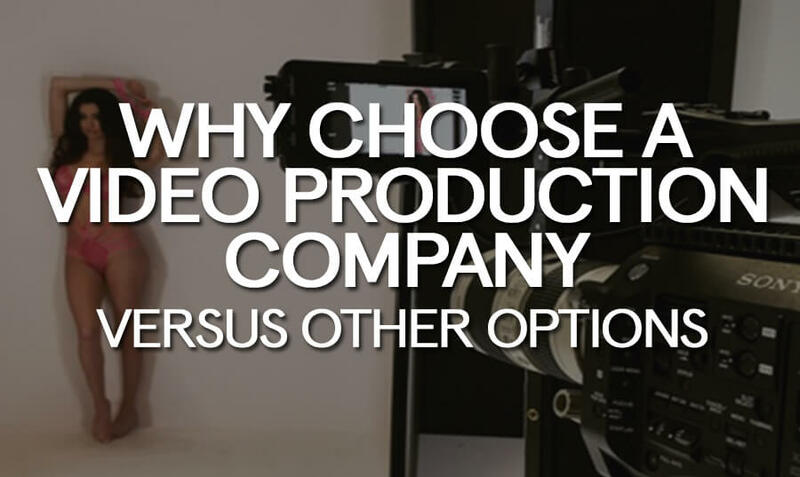 A company that creates a relationship with a video production company will be able to create everything from full length commercials to internal messaging, whereas a company working with any of the other options may find that they are instead limited in their option. The only downside of a video production company is that they may not be worth it for very small, short, or fast videos. Video production companies can also tailor their services to a business; such as a business that wants to create regular videos and only wants to hire a solo professional. Many companies may be able to give specific information regarding their project options and their quotes. This makes a company more flexible in general and allows them to pivot properly, without having to invest in costly equipment. Companies are also going to be able to ask the company for professional advice regarding the types of decisions they should be making about their production and how many resources will need to be involved. Here is an example of a promotional video that was produced by a video production company. Notice the beginning of the video starts with subtle motion graphics that creates the title of the video. The on-camera talent are professionals. The company chose to shoot the video in multiple scenes to create more visual appeal for the viewers. There are also many props and set design changes throughout the video. All in all, this is a well-produced video. This overview should give you a relatively firm idea of the type of company that you need to hire for your next production. In general, an all around video production company is usually preferred for a project, unless it it is a small production or unless it needs to be extremely well-integrated into your advertising campaign. In some situations, though, you may want to consider working with a professional or just creating videos internally, for small and low budget projects. A production company should usually be consulted for a quote first, because many companies may be surprised at how affordable a professional video production company can be. Article by Joe Forte, producer and co-owner of D-Mak Productions, a professional video production company located in Phoenix, Arizona.